The Federal Open Market Committee adjourns from a two-day, scheduled meeting today, the sixth of 8 scheduled meetings this year, and the seventh Fed meeting overall. The FOMC is a designated, 12-person committee within the Federal Reserve, led by Fed Chairman Ben Bernanke. The FOMC is the voting members for the country’s monetary policy. Among its other responsibilities, the FOMC sets the Fed Funds Rate, the overnight rate at which banks borrow money from each other. 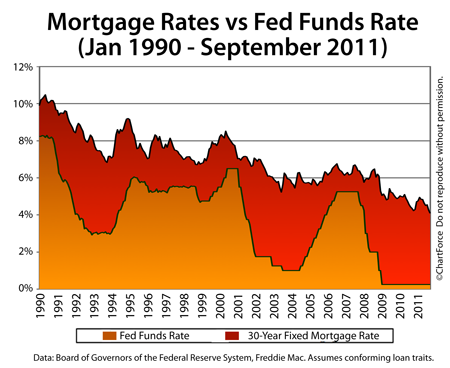 Note that the “Fed Funds Rate” is different from “mortgage rates”. Mortgage rates are not set by the Fed. Rather, they are based on the price of mortgage-backed bonds, a security traded among investors. As the chart at top illustrates, the Fed Funds Rate and conforming mortgage rates in Brentwood have little correlation. Since 1990, the two benchmark rates have been separated by as much as 5.29 percent, and have been as close as 0.52 percent. Today, the separation between the Fed Funds Rate and the national average for a standard, 30-year fixed rate mortgage is roughly 4 percent. This spread will change, however, beginning 2:15 PM ET Wednesday. That’s when the FOMC adjourns from its meeting and releases its public statement to the markets. There is no doubt that the Fed will leave the Fed Funds Rate in its current target range of 0.000-0.250%; Fed Chairman Bernanke plans to leave the benchmark rate as-is until at least mid-2013. However, the Fed is expected to add new support for markets. Unfortunately, there are few clues about how the Fed will support markets, and there is no consensus opinion regarding the size of the said support. As a result, mortgage rates should be bouncy today. First, they’ll be volatile ahead of the Fed’s statement. Then, they’ll be volatile post-Fed statement. Even if the Fed does nothing, mortgage rates will change. This is because Wall Street is prepping for an announcement and — no matter what the Fed says or does — investors will want to react accordingly. When mortgage markets are volatile, the safest move is to lock your mortgage rate in. There too much risk to float.